PFC Bradley Manning–Is he a traitor, or is he this war’s Daniel Ellsberg? 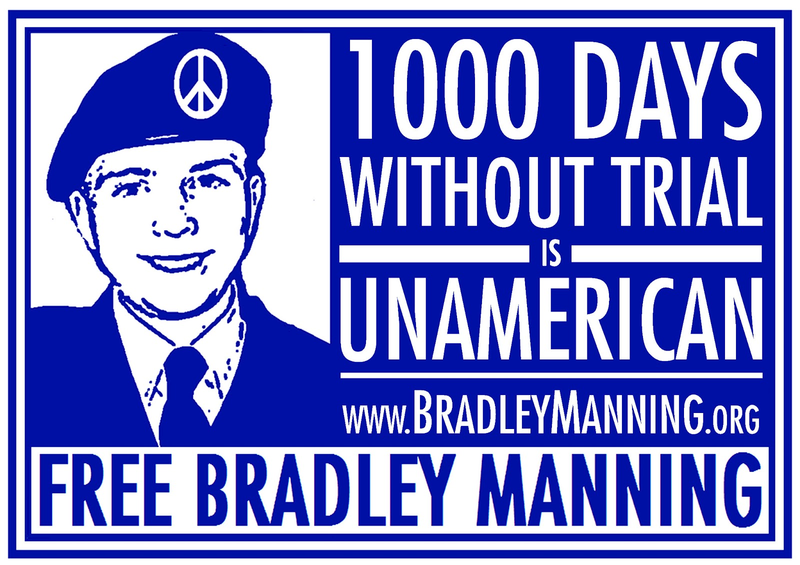 On Saturday, there were vigils and protests all over the world to commemorate the fact that former US Army PFC Bradley Manning has spent one thousand days in jail without being given a trial. His crime was leaking information to Julian Assange and the Wikileaks consortium, which then appeared everywhere. In particular, Manning had leaked a 2007 video of two Apache Helicopters unleashing 30 mm cannon-shells loaded with mayhem on a Reuters photojournalist in Iraq, first gunning down the journalist and his driver, and then blasting away at people trying to come to their aid. At least eleven civilians were killed, none of whom were attempting to fire back, and two children were seriously wounded. The US military had claimed that the dead were killed in a legitimate fire-fight. You can judge by viewing the video here. The video had been classified as ‘secret’. But who was it being kept secret from? Certainly the Iraqis knew about it–both civilians and the many ‘enemy combatants’. The only people who don’t seem to know about it are the people who are paying for it–that would be you and me. And this isn’t the only thing we’re paying for that we’re not informed about. For years, both the Bush and Obama administrations have maintained that the US was not keeping track of deaths in Iraq. Thanks to Manning’s release, we know that is a lie—Between 2004 and 2009, the U.S. government counted a total of 109,000 deaths in Iraq, with 66,081 classified as non-combatants. This means that for every Iraqi death that is classified as a combatant, two innocent men, women or children are also killed. Again, ask the Iraqis about their dead. THEY know. That isn’t the only embarrassing secret we know thanks to Bradley Manning and Wikileaks. And the website doesn’t even contain my favorite Wikileaks revelation–that the Obama administration pressured NATO allies to scuttle efforts by their judiciaries to indict Bush and Cheney and other members of their administration for war crimes. Again, this isn’t a secret to our NATO allies. It almost certainly isn’t a secret to Bush and Cheney. And even though all of this information has been put forward on the Internet, the US government has warned its employees that it still considers the revelations secrets–when 23 year veteran State Department employee Peter Van Buren linked his blog to one of the released Wikileaks cables, his security clearances and diplomatic passport were rescinded, effectively ending his career. More than one commentator has called out Obama for declaring war on whistleblowers. It’s one more knock against a president whose defenders always have an excuse for him. But while they’re making excuses, Bradley Manning’s treatment while incarcerated (and remember he’s being held as a DEFENDANT–he has been convicted of nothing) has been widely reported– Amnesty International had contacted Defense Secretary Robert Gates to note that Manning’s pre-trial detention itself amounts to punishment (solitary confinement 23 hours a day in a sparsely furnished solitary cell and deprived of a pillow, sheets, and personal possessions since July 2010). I hate it when Amnesty International contacts the government I pay for in order to ream them out for their treatment of our prisoners. So that’s how Manning spent day 1,000. There’s a hearing shortly to determine whether Manning deserves to be released due to the fact that the Army has kept Manning imprisoned while continually delaying the trial. Besides the people at bradleymanning.org, you could do worse than checking out the group Trifecta Resista, which has been organizing regular protests outside Fort Leavenworth, where he’s held. You could also do worse than drop him a friendly letter. 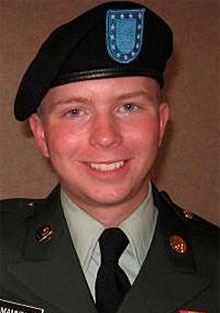 a) PFC Bradley Manning cannot receive any cash, checks, or money orders. His legal team is responsible for ensuring that Bradley has sufficient funds in his detainee account to purchase items such as stamps, envelopes, toothpaste, etc. c) Incoming mail will be returned to the sender if, in the opinion of the confinement facility, falls into any of the following categories: 1) Contains inflammatory material or advocates escape, violence, disorder or assault; 2) Directly or indirectly threatens the security, safety or order of the facility; 3) Contains coded or otherwise undecipherable language that prevents adequate review of the material; 4) Is received with “Postage Due”; or 5) Contains items of contraband (including anything of any material value, including postage stamps or cigarettes). Kind of doesn’t need a caption, does it? This restrictions placed upon mail in the military penal system does allow for birthday cards but a get well card would probably be too subversive and inflammatory and could be advocating escape. Why reblog this now? because some of the Wikileaks revelations have to do with the 2016 campaign. Two of the pertinent revelations (both involving Clinton as Secretary of State): 1) she stopped NATO countries from indicting W for War Crimes; 2) she helped kill efforts to get Haitians a 62 cent minimum wage.